← Birkenhead’s Brush car moves to Taylor Street! 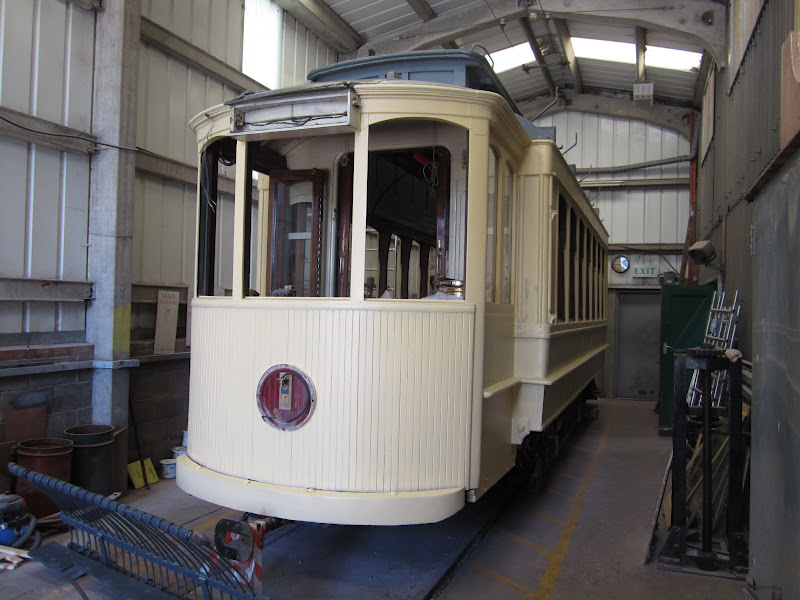 Pleasing news to report from the Beamish Museum Tramway concerns the former Oporto tramcar, now generally referred to as Beamish 196 which has been undergoing an extensive overhaul for several months now. Following completion of work on its truck and significant body work, 196 is now in the early stages of being repainted and will soon return to service looking very different from how it appeared when it last ran in 2011! 196 is now in an unusual all-over cream, but this isn’t a new livery for the tram, which will instead be outshopped in a blue and primrose livery inspired by the former South Shields tram system. As no trams from this town have been preserved, this will represent another lost tramway from the North East. Further attention being lavished on the car will see new roof advert boards fitted, which will extend for the full length of the body sides and along the ends of the tram, in a similar style to traditional Gateshead single-deckers. These will also feature the familiar ‘Shop at Binns’ slogans on each end, as per Gateshead 10. Painter Phil Anderson, who has already repainted Blackpool 31 and Newcastle 114 to an extremely high standard for this musuem, will soon get to work on completing 196‘s new identity. It is hoped to complete the tram by mid-August, so that it can return to service allowing Gateshead 10 to be withdrawn for its own repaint. This car will of course be treated to a coat of green to recreate its former identity of Grimsby & Immingham 26, with a tight timescale in place to enable it to appear in this condition for the ‘Power from the Past’ event at the end of August/beginning of September. With no visiting trams expected for this event, having two familiar trams in different liveries will add considerable interest and hopefully this will be another successful event for those interested in all different forms of transport. This entry was posted in Beamish Tramway. Bookmark the permalink. Yet again beamish leads the way in variance and also quality. Will make the visit to see this. This is a sad time for Beamish and my thoughts as I am sure are everyones goes to all those involved in the awfull tragedy of yesterday.